– A man and a woman hug and kiss tenderly. ► Many scenes take place poolside and on beaches where men and women and children wear swimsuits that reveal cleavage, bare abdomens, bare backs, bare chests and legs to the hips. A man’s swim trunks pull down slightly to reveal upper buttocks and buttock cleavage briefly. A man sleeps in bed shirtless (we see his bare chest, abdomen and shoulders). 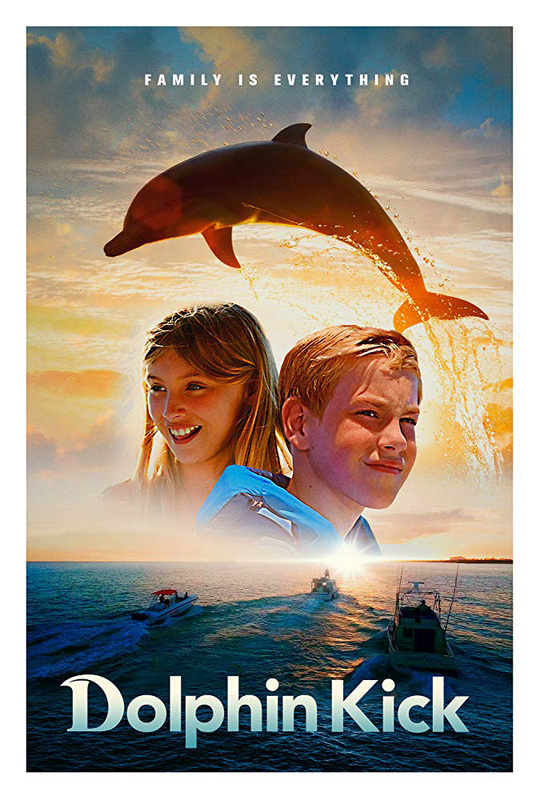 - Three men on a boat discharge spear guns at a dolphin, one man swings a hook over the side of the boat to try to hit the dolphin and one man aims his spear gun at two children on another boat; a boy shoots a flare gun at the men on the boat (no one is harmed). ► Two men fight on a boat, and one holds a spear gun across the throat of the other man who head-butts him. A boy tackles a man and knocks him off a boat and they both float motionless (they are both revived). A woman hits a man with an oar a few times. ► A man throws an explosive in the water presumably to bring fish to the surface while out on his fishing boat; we hear the explosion and water is thrown into the air. A man holds a large knife in his hand while he talks in a threatening manner to two children. A man talks about, "Getting that dolphin." A man loads his spear gun and plans to find a dolphin and kill it. Two young children take a motor boat out into deep water and they run out of gas. ► A man stands between a man and his two children and tells him to never talk to them again. A man yells at another man and accuses him of cutting his fishing lines until another man pushes the yelling man away (this happens in a few scenes and between a few different combinations of men). A man yells at another man for not stocking their fishing boat with bait. A young boy who is afraid of the water nearly walks off a pier. People on a boat try to get a buoy out of a dolphin's mouth and keep it quiet when a fishing boat approaches. ► A man reviews water safety with his two young children while they are on a boat including life-vests, fuel levels and no water in the boat. People tell a man that he was ripped off for the amount he paid for a glass of lemonade. A young girl runs away from a restaurant and cries on a beach; she tells her father that she wants her mother back. A girl tells a man, "We can smell you." People talk about a man having sunk his own boat with all of his research projects on it. A woman says, "People will try to kill you for this stuff." A boy yells that a men with spear guns are "going to kill him," referring to a dolphin. A swim coach tells a young swimmer to, "kill 'em," before a competitive meet. We understand that a woman died but we do not hear about the circumstances. Children ask a girl if there is something wrong with her brother and why he won't swim anymore. ► A dolphin splashes a young boy sitting on a pier, and the boy dangles from the end of the pier and falls in the water where he swims with the dolphin and holds onto its fin (no harm comes to either of them). A young boy sitting on a pier is startled when a dolphin jumps into the air near him. ► Several people talk about cleaning up an area of the ocean from pollution and we see them with bags of garbage after a dive. A man coughs up water after nearly drowning. - A man says that he will take another man for a drink, "Just one," and the other man says, "Or six" (we do not see them drinking). - Death of a parent, fear of water, dolphins, echolocation, loneliness, coral reefs, friendship, family, sense of belonging. - Don't let life pass you by.